I can't believe it's been over two years since I read ME BEFORE YOU by Jojo Moyes. I absolutely loved this book -- you can read my review here. It made me laugh and cry and I couldn't get these characters out of my mind. All in all, a book that does that is pretty special! So when I received a copy of AFTER YOU, I was absolutely thrilled and had to read it right away. AFTER YOU tells Louisa's story... after Will. Will told her to "Live boldly. Push yourself. Don't settle. Just live well. Just live." Sound advice, sure... but a lot harder to do when you're the one missing the love of your life. The book picks up six months after Louisa's loss of Will. She has spent time traveling and is trying to move on, but it's not exactly working out too well for her. When she has a serious accident, she is forced to return home. And by home I mean her childhood home -- the one with her parents and sister and nephew. As Louisa's body heals, her mental state is still fragile. She ends up going to a grief support group where she meets an interesting (and humorous) cast of characters. She also re-connects Sam, the paramedic who saved her life. As she tries to move on and begin a relationship with Sam, she is blown away by a person from Will's past; and her involvement with Sam is jeopardized as well as her ability to move on from Will's death. I loved AFTER YOU! Of course, it didn't hurt that I absolutely love Louisa and wanted to know what happened to her after the last pages of ME BEFORE YOU. Once again, Ms. Moyes has written both a touching and funny story that is guaranteed to warm your heart. This novel touches upon so many important themes like family, friendship, loyalty, and love; and if you loved ME BEFORE YOU, then it's a must-read. You might think that a book about a young woman who has lost her lover would be sad and depressing. And don't get me wrong, there is plenty to cry about in this story. Louisa is in so much pain and it almost seems like the vibrant woman we know from ME BEFORE YOU is just a shell of herself. However, AFTER YOU is funny... really funny. I think that's a testament to Ms. Moyes' writing. Ms. Moyes just keeps getting better and better. I love her books... all of them, and she's becoming one of my favorite go-to authors. I really appreciated how she decided to tell the story in AFTER YOU. Most of the book is written in Louisa's voice and she did a remarkable job of bringing Louisa to life and making her seem genuine. When the story changed points of view towards the end of the book (I don't want to give you much more than that or I might spoil the surprise! ), I found it such a smart and refreshing choice. I have to wonder if readers might see this character in a future novel. AFTER YOU is a great suggestion for book clubs. It's a quick read -- mainly because you get so caught up in Louisa's life and can't put the book down. It's also full of so much to discuss. Louisa is a fascinating character, especially given her accident and her attempts to move on. In addition, there are so many themes that readers will relate to including the importance of family, support, grief, loss, second chances, forgiveness, acceptance, friendship, personal freedom, and love. There is a reading guide available with ten thought-provoking questions which might prove helpful to keep your discussion on track. There is also a book club kit which includes recipe suggestions, playlists, craft ideas and more -- how fun! AFTER YOU is a beautiful (and funny) story about moving on and finding happiness. Highly recommended! 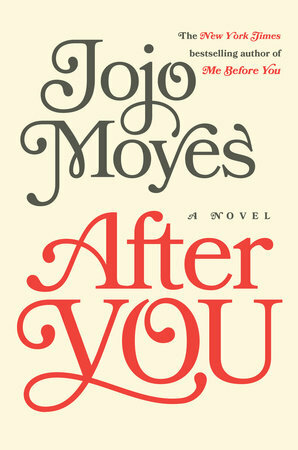 Giveaway alert: I have a copy of AFTER YOU to share with one lucky reader. To enter, just fill out the form below before October 19th at 11:59 p.m. EST. I will randomly select and notify the winner the following day. This contest is open to those of you with U.S. addresses only. Good luck! I've got this one on my iPad now. I need to read it before it is due back next week, because I've been waiting for it since I found out it was coming! I loved Me Before You as well so I'm really looking forward to this. I'm glad to hear it's so good! I loved this one! Good luck to those who enter the giveaway; they have some great reading ahead!